These days one of the famous Bulgarian bloggers decide to set up on him personal blog a little GoogleBomb. He saw that on the site of the Government missing instructions for the search engines such as Google or Yahoo. These missing instructions are simple – in the hosting directory folder HTML programmer should put and keep a file with name “robots.txt” which contains these two phrases. He wrote that this means “….if you are the search engine the site tells you – Do not index me!! Get out of here!! !” so if you try to find site of the Bulgarian government through Google it is impossible. Then he has decided to make a simple GoogleBomb. It is easy to make this if you have more than thousand visitors per day and your Google rank is high. He has just put in the blog anchor (link to the webpage of the government) with name провал (failure) and which linked in to the site of Bulgarian government. Two days after the Bulgarian mass media were filled with news which has been describing how the “hacker” is prepared googlebomb of the Bulgarian government. Why I wrote this – my only one reason is to keep this in mind and next time when I prepare some page to put this little text file into the main directory. There are no other reasons for this my post. TOSHIBA - never again !!! I decide – never will buy TOSHIBA again. It doesn’t matter what kind of device or service – just I’ll keep my money far from this company. I will not purchase anything even than batteries!!!! This decision of mine is because their “good” warranty support. But what is happen and what lead me to this? When I was in Canada I found that there are cheaper laptops than Bulgaria. As a fact in Bulgaria TOSHIBA Satellite A300 – 05U01C is near to 900 €. In opposite site of the Earth – Canada the same TOSHIBA Satellite A300 – 05U01C costs only 600 €. Enormous difference of course round 30%. So this difference makes me to take decision to buy this machine from the country of maple leaf. Yes of course when I bought this TOSHIBA Satellite A300 – 05U01C from Staples I have ask them about warranty and also ask TOSHIBA support center about international warranty. They gave me explanation that if something is happen with my TOSHIBA Satellite A300 – 05U01C everything will be OK in Bulgaria. Everything was OK until January 10, 2009. At this day I have just worked with my laptop when he decides to die. Yes just when I typed some words and the keyboard stopped to work also everything freeze and nothing happens. Just like that. Because I shall go to work I leave it. When I come back at the evening I found it black and without any electricity on it. Immediately I plug it on the electricity but again nothing happens. There was neither battery recharging light or power light flashing. This get me in shock of course because I know how fast work warranty services in my country. But I could do nothing and on the morning I called to the phones given on the TOSHIBA site. The girl from IMPEX Bulgaria (which is the official distributor of TOSHIBA for BG) explained me that I should send my laptop and original receipt (for evidence!) through courier into Sofia and after repairing they shall return to me with the same courier. I call the sedition company and they took my PC at January 11, 2009. They had delivered it at January 13, 2009 at IMPEX and from this time my long waiting start. Here I have posted print-screen picture of my repairing status and anyone can see how longer it continues. Between January 13-Th and January 23-Th everyone are able to see that is nothing happens. IMPEX just “require info”. I had been thought that everything will be faster and will run smoothly but NO. I couldn’t understand what is behind “require info”, but I suppose that IMPEX just sent them my bill for confirmation about supported warranty. Unfortunately might be they sent the recipe through some of the fishing trawler to Canada. I just have not other explanation. But I think TOSHIBA should look about this type of communication. At January 23-th they have received required info and started to apply for part. This part they request from Germany. My GOD I hope that they hadn’t ordered from Canada. It had been took a mounts for delivering. So on the 13-th day from order the part was delivered and I call them when I should expect the delivery of my laptop. Unfortunately again I don’t estimate the situation properly. 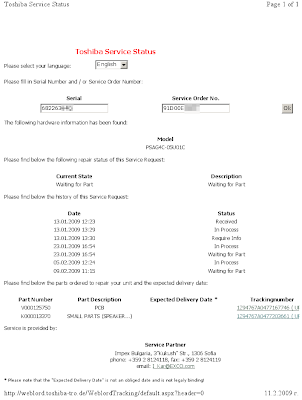 At February 09, 2009 in the site instead the sentence “Sent to the customer” had just appeared “waiting for part”. AGAIN!!! Now the pcspeakers was burnout. What going on? When everything happened I worked on the battery. How is possible to burn out the main board and speakers. And what if something other is burned out? I shall wait until the end of the century. TOSHIBA support eh? So I still wait for my laptop and because I have other PC I am able to do my extra job. Expecting from TOSHIBA to repair their stupid Satellite A300 – 05U01C I can loose money and contacts. I shall thank to my old PC desktop station but unfortunately he is a totally immovable. Now at the end when you decide to buy any TOSHIBA products just keep you in mind my story and if you don’t mind consult about warranty with your local service. You may fall in the same situation. For me I have decide – TOSHIBA NEVER AGAIN even BATERIES. Old Moskvich 403 for sell. Very old model of Moskvich 403. It is a made in 1960 years and still working normally. It can ride and only the tires are little bit worn out. Of course the owner trying to sold it many times but with lack of success, because in Bulgaria no one buying this cars. Now I will try to sold it abroad where car could meet the real connoisseurs. I have decide help him to sold this ancient car because I think this kind of cars must be driven not only stay on the garages. Of course it could be driven only after little repair which will not cost so lot.